← Does the media neglect policy? We should expect that public transport travellers will increasingly be seeking to make intra-suburban trips via a grid of well coordinated train and bus services. Indeed, many advocate such an approach. A two-part tariff based on distance from the CBD makes less sense in that situation. While the CBD will remain the main market for trains for a considerable time yet, they nevertheless are likely to have a growing role in intra-suburban travel. Policy-makers should be thinking about how to make them work harder in this role. An alternative would be simply to have a single zone system. That doesn’t appeal to me intuitively, but it has the virtue of simplicity. If I assume that 25% of fare box revenue comes from Zone 1-2 travel, then I estimate guesstimate an average fare in the order of 16% higher than the existing Zone 1 ticket would be needed to maintain revenue. Zone 1-2 fares would fall by a similar amount. But a better approach would be to charge according to the level of system resources used by the traveller – in other words by actual distance travelled, irrespective of direction or destination. A convenient measure of distance would be the number of stations passed through on a trip. The great advantage of well-designed smart ticketing systems is that they permit this sort of flexibility. Hence if I travel 20 stations I would pay proportionately more than if I travel only 3 stations. For example, assuming a fixed charge of (say) $3 per trip inclusive of the first five stations for a Two Hour ticket, the variable component might be $0.15 per station thereafter up to a maximum fare of (say) $7 (these numbers are of course meant to be illustrative – tariffs would need to be modelled to see their effect on revenue). Extrapolating to buses and trams adds a degree of difficulty, but in principle it should be possible to devise a simple equivalence table. For example, the flag fall might include 10 – 15 stops with subsequent stops charged at $0.05. Travellers would of course be required to touch off. A tariff based on actual distance travelled would better reflect the demand, be more equitable and eliminate some of the gross anomalies of the current system. No doubt it would have its challenges – some people would feel better off, some worse off. On a recent holiday to Brisbane/Gold Coast I found their multi-mode “Go Card” very convenient and seemingly charging distance-related fares. It has been done, and works for buses down to NSW border, along GC/Brisbane rail link and all around Brisbane. Is the system you suggest similar to the current Myki system being introduced? Seems to have a lot of similarities, particularly about how the tariff is based on the actual distance traveled. Totally agree with you either way, good post. Alan, you’re on the right track with your argument. The two-zone fare system (previously 3 zones) is a legacy of the late 1970s, an era of pre-printed paper tickets before the invention of electronic cash transaction systems using data-interchange. The Victorian state government sought to reduce staff operating costs of PT ticket vending by creating a very simple fare structure that required only a handful of physical paper ticket types to be held as stocks on vehicles and at rail stations. The preceding ticket systems had many more incremental steps of pricing, e.g. Melbourne rail fares were stepped according to station-by-station distances, and tram and bus fares were stepped in pre-set distance-related sections (up to 10 sections or more on some routes?). In 1984, the Cain Labor government attempted to introduce a paper ticket-based system of 10 fare zones with smaller proportional pricing steps – the “Neighbourhood” fare system. It failed, due to the understandable confusion at the points of ticket purchasing. Contrast this with the semi-distance-related (i.e. rail station-by-station) stepped fare systems used in Singapore’s MRT rail and buses, and on Hong Kong’s MTR, buses and trams. In both cities, a single multi-modal ticketing platform of smart cards (EZ-Link in Singapore) enables the traveller to validate-on (upon boarding) then validate off upon alighting without having to think about then choose a fare (ticket) type. The problem with Melbourne’s 2-zone fare structure is in the very large pricing step suffered by many travellers residing in the middle distance suburbs when they travel just one bus stop or one train station beyond the end of the very narrow 1-2 zones’ overlap sector. For example, on the Sandringham line, 10 stations enjoy Zone 1 fares, and travel to or from Hampton (the 11th station from the CBD, and a Zone 2 only station) suffers a near-doubling of the usual Zone 1 fare. It is even worse with travel to or from Melbourne and inner areas from precincts close to several of the Zone 1 stations (Elsternwick, Gardenvale, North Brighton and Middle Brighton) on the Sandringham line when feeder bus routes to these stations are an option. Most of the feeder buses require payment of an additional Zone 2 fare, even to travel just one bus stop! This makes bus and train travel unattractive, and causes many travellers to use cars only or to drive their cars to local rail station car parking which spills out into neighbouring streets. One reform to this situation is to introduce a “sliding” geographic overlap of zones 1 and 2 that is defined by an actual travel distance in kms, i.e. a “Zone 1X2” (or “Interzone 1-2”, to give it a temporary name?) which allows travellers to make trips on two or more modes of travel for a fare calculated to be between the “flat” Zone 1 or Zone 2 and the combined Zones 1-2. This overlapping “Zone 1X2” fare would be calculated as the travelled distance weight-average of the Zone fare applicable to the majority of that trip’s travel distance (or stops), plus a fraction of the zone fare where the minor part of the trip distance occurs. For example, for a train traveller from Hampton station to Melbourne CBD, the computed fare would be Zone 1 (Brighton Beach station to CBD, some 10 stations travelled as the majority of the trip distance) plus one stop’s “distance” (Hampton to Brighton Beach, being an extra “one-tenth” of the major travelled part in Zone 1) which is then calculated as one-tenth of Zone 2 fare for this extra distance. For travel between Melbourne CBD and Sandringham station (the 12th station), the computation would be Zone 1 fare plus two-tenths of the Zone 2 fare. Analogously, a similar dynamic fare computational rule could be set up for travel on Zone 2 bus routes interchanging with the Zone 1 stations on the Sandringham railway. This computational rule would maximise at a travel fare equal to the pre-set combined “flat” Zone 1 / Zone 2 fare. Whilst this could not be done on the 18-year-old Metcard magnetic strip card ticketing, it could easily be done in Myki where the smartcards interface (data read/write) with computers. The human doesn’t need to think, but just travel! Let’s face it we aren’t interested in the ticket – we don’t buy a ticket for its own sake!! No, we are purchasing the entitlement to travel to places of desired activities. It’s no different to shopping in a grocery supermarket or a department store. Are we buying the merchandise, say, fashion clothing or groceries, or are we more interested in the plastic carry bags? The other generalised reform would be, for Myki usage, to phase out the 2-zone metropolitan zonal fares and introduce the more finely-incremented fare structures in use in Hong Kong or Singapore. The benefit thence available to Myki users relative to the use of Metcard may well accelerate the acceptance of Myki! Remember that there are additional fare zones in force in transport services beyond the metro area, e.g. 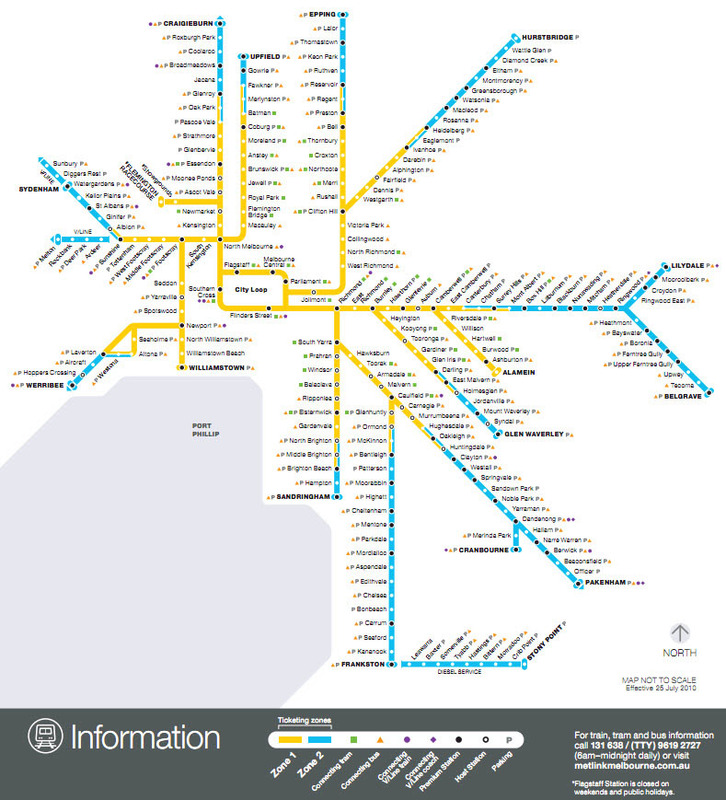 Mornington Peninsula rail and bus routes. With Smart card AFCs such as our Myki, “time-of-day” or “demand-yield” pricing (sliding between peak and off-peak patronage levels) and frequency-of-use pricing (retrospective “loyalty” discounting) could also be introduced as computational adjustments to an actual or “pseudo” distance-based fare structure. We need to rid ourselves of the two-hour concept and bring back “single trip” ideas – which HAVE to cost a different amount on each different mode. I don’t see why I have to pay the same amount to get to my local shops (2.5km) by bus as my sister does travelling 10 times the distance via bus and two trains. It makes no logical sense to me. We can either follow London and introduce more zones (they have 9 with 1-6 stations in each zone) or follow NYC and have only one zone. Whichever we do, we need to do it right. Toronto has a single zone covering The City of Toronto and flat fare system within this boundary (surcharges for downtown express). a buffer of uncertainty should also be built in (say plus or minus 5 minutes) to mimic the effect of overlapping zone boundaries and prevent passengers being charged different fares for the same trip on different days of the week due to variances in road traffic conditions. Transfers under this system could still be free and charging only for in-vehicle time. Using smartcard systems, it would be very easy to calculate the time spent on PT and charge into bands according to that. Online mapping tools could also estimate the charge as well. With so many delays on our current system this time model would be chaos. I like Toronto’s system, which is like NYC with only one zone. The standard (unless you have a monthly pass) is to pay per trip. It’s just easier and might I add actually cheaper for users than Melbourne’s system. Plus I believe Toronto recovers nearly 80% of its operating costs from tickets so it works. to how much time you spend on PT, regardless of whether you are travelling to the CBD or cross-town, and also different to the horrible ‘fare stage’ system as well. – What rate of fare-box recovery? – How elastic is demand to distance-based pricing? There is no point putting the effort into a finely-grained distance based trip system if customers don’t respond to that incentive. Maybe we want to shape the pattern of their trips – maybe we are already doing so, but it needs refinement. – How finely grained should your system be (and the relative cost of that). In mathematical terms, a zoning system is a distance system, just with (very) weak granulation and uneven boundaries. A distance based system is only better when looked at in particular ways, and to the extent pricing affects travel behaviour (and if it doesn’t why go to the trouble of distance based pricing), doesn’t allow you to use ticketing to help shape certain desirable policy outcomes. Zoning has its merits in other ways, but I’d agree that Melbourne could be improved. For mind, the ticketing should reflect the organisational structure of the system’s connections – Melbourne, not having an organisational structure is a problem in this regard. If a city’s transport system is an ordered grid of otherwise identical routes then a pure distance measure makes sense. In a spoke and hub system, you ought to charge more where demand is high (near the hub), than when demand is low, so a case can be made for a flat price through-out the system. In a system of mini-spoke-and-hub nodes, connected by a backbone network, you could apply a flat charge to go to any of the mini-hubs, and distance (or counting) based pricing to move between them (with a surcharge for congested parts of the network). Alternatively, does Melbourne need a ticketing system at all? It is an extremely labour intensive and inefficient method of collecting revenue, particularly when the government is covering 50% of the costs through general taxation anyway. The argument for a single zoning price is that the people who live further out tend to have a reduced number of services. If you use the example of the Belgrave and Lilydale lines both feeding trains into Ringwood and beyond. Anybody between Ringwood and Camberwell (where another line feeds in) has twice as many trains servicing them as those that live further out and pay the higher price for the service. In effect the lower fare paying customers are subsidised by the outer suburban people. Brad the counterargument is that the marginal cost of servicing an outer suburban area is typically higher. Distances are longer, passengers fewer, and even with fewer services the cost of infrastructure provision and maintenance is higher. Those in the inner areas have a lower cost of service provision as there a more of them (providing more overall revenue), and the distances are shorter, so you need less rollingstock to provide good frequencies on that shorter distance. Sydney’s rail system is set up on the basis of distance travelled, which makes it ridiculous to use. For example, if I pay for a weekly ticket from Ashfield to Artarmon, I can’t use it to travel to Bondi or St Peters or Kings Cross or Mascot or a lot of other stations within a similar distance of Central. Melbourne’s zone system allows people to go wherever they want in a zone and then catch a tram at no extra charge. This makes it very easy to use public transport and the last thing Melbourne should be considering is “rationalising” it. Tollways charge only for the number of tolling gantries you pass under, theoretically up to a maximum per trip (on EastLink anyway). Why not have the same for public transport? You could easily set this up so that any trip you made would be tolled, up to a daily maximum. That way payment is based on total usage rather than distance travelled. I’m sure that could be achieved with Myki, it would just mean changing the software. It drives me crazy being required to pay for a two-hour ticket in the city, when all I want to do is catch a tram for three stops – no such thing as a short trip ticket anymore. Back in the days of connies that kind of trip only cost 50c. I’m sure something like that would reduce fare evasion. OR… How about just increasing the overlap for Zone 2? The Zone 2 overlap could be increased to say within a few stops of the city centre. This would still bring the advantages of having a zone 1 only ticket for city commuters, and offer a cheaper option for non-city travellers who are travelling between suburbs only. Those who make the full trip from outer suburbs to the city would still pay the higher-priced Zone 1+2 ticket to compensate for the longer distance. Changing trains to other lines would probably be cheaper this way, as a commuter wouldn’t have to hold a zone 1+2 ticket to simply travel through a zone 1 area (think for example if you were travelling from Hoppers Crossing to St Albans and zone 2 overlapped all the way to Footscray). Or otherwise, under this system perhaps the ticket required should only be based on the point of entry and exit, and any travel through zone 1 only areas would not need to be charged. This option would thus effectively subsidise long trip commuters who often have fewer services and longer trips, and not unfairly charge them for accessing busy transport hubs such as the city which they would not be really using any way other than to be just passing through. Also, for short trips within the city, my personal opinion is that tram and train trips within the CBD (perhaps the region covered by the ‘City-Saver’ zone or smaller) should be completely free. They’re often quick, short trips that are used intermittently between streets. And with such high patronage in the city area, why bother with enforcing fares for such trips? Sometimes, it would take a longer time to buy a ticket and validate it than it would to just ride the tram a few stops. Re: short trips – I’ve heard that AOs are advised not to fine passengers if they only use the tram for a trip up to two stops. Don’t have any confirmation on that though so don’t try it out on my advice! We already have in operation on the tram system a single zone system, but also allowing passengers who travel solely within Zone 2 to pay the lower fare. I can’t see why this system can’t be applied to the train system as well. Some revenue may be lost to the demise of Zone 1+2 fares, but it may also avoid the need to build more (rather expensive) car parking facilities at boundary stations such as Heidelberg. It could also give a more accurate idea of where the users of public transport actually come from (i.e. What percentage of Heidelberg passengers are actually Rosanna passengers saving money). Not quite sure what to do about the buses, particularly given the difficulty for passengers to know if they’ve crossed the zone boundary. A distance based fare may be more useful if the government could manage to get the technology to work. A simpler way may be to make buses all Zone 2 but allow Zone 1 fares (which cost more anyway) to encourage modal transfers. Currently I travel up to an hour in Zone 1 to get to work – I take a train then a bus. The return journey is often a bit longer – tram to Flinders St then a train home (I tried taking the bus, but it’s far longer going home because of traffic and a bunch of other factors). It’s only because this is a single fare that I choose it over driving in peak hour. The distance or stop-based fares being proposed would have me out of PT and into my car quicker than you can say “climate control and no people infringing on me with their loud mobile phone convos and coughing their sickness at me.” Thus leading to more congestion on the roads, as I’m sure I’m not the only one who sees my cross-city journey as arduous and only viable as PT is soooo much cheaper than driving/parking. As an aside, I tried this journey using Myki once and it failed to read twice and I was overcharged, so I went straight back to my trusty Metcard. The fifteen minutes I spent on the phone trying to get my $2.70 (or whatever it was) back was also disheartening.